I view people who manage to put their gardens beautifully to bed for the winter with envy – and a little suspicion. I simply can’t believe anyone has that kind of time and energy in the fall. They must be slacking off in other areas — the canning gets short shrift, they forget to bake for the school fundraiser, the closets are crammed with the moldering remnants of past lives or their desks are buried beneath an avalanche of paperwork. At least I hope so; I not only fail to get fall cleanup done ‘on time,’ i.e. before the weeds scatter seed and the pests I’ve been dealing with have dug in for next year, I’m guilty of all those other things, too. I’d like to be Martha Stewart, but I’d need her staff and regular doses of Prozac to get there. I do have a few legitimate excuses for not doing the end-of-season clear up. One is exhaustion coupled with the unforgiving deadlines of canning added to the other deadlines in life. Another is the habitat and fodder that the desiccated stalks and seed heads that wave over my untended garden offer wildlife. About 14 different bird species flit through it right now. But a big reason I wait is the pleasure I get from working outside on a beautiful winter day without the sense of urgency that the seasons often impose. Boxing Day (December 26th) was mild and sunny. I’d been eying the overgrown raspberry patch for a while. The patch, comprised of several varieties each of black and red raspberries, is planted in a large U with a path down the middle. The black raspberries (Rubus occidentalis) originally occupied about eight feet on one side, but insist on reaching long, lethal-thorned tendrils to root in other sections. 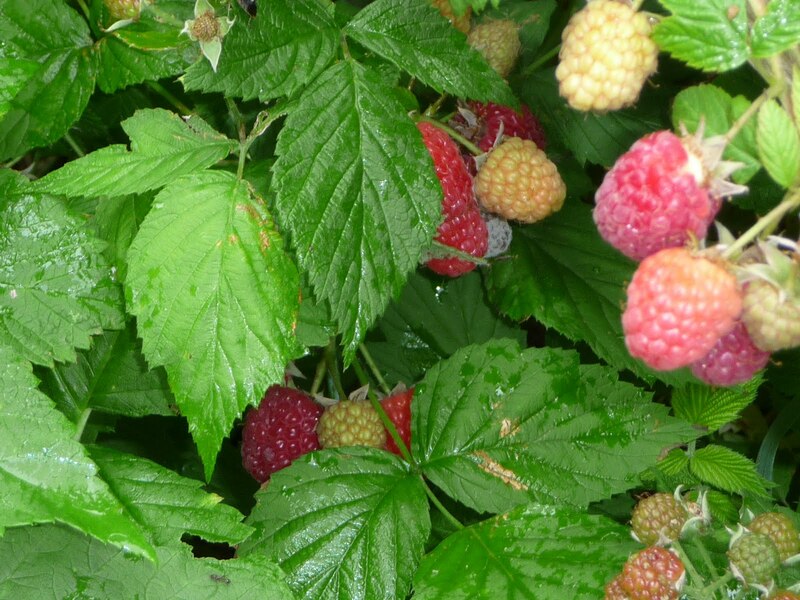 The red raspberries, comprised of both June-bearing varieties and so-called fall-bearing varieties, are less ambitious, so I have to keep after the blacks. The blacks and some reds are June-bearers (floricanes, which produce fruit on one-year wood). They bear fruit early in summer, while the fall-bearing varieties (primocanes, which fruit on both one-year-old wood and on new green canes) will, if left to their own devices, produce twice a summer — once around mid-June and a second time from late August to frost. Often the fall fruiting is more abundant than the early summer crop, which is why most people simply cut down the whole patch at the end of the season, allowing only new wood to spout up and produce the single end-of-summer fruiting. I don’t. The weather is squirrelly, (and I’m greedy) so I figure whenever those babies want to offer up fruit, I’ll gladly take it or offer it to friends. Plus, the past two or three summers, the weather here has screwed the pooch for the fall crop. Mid-summer drought, despite drip irrigation, slowed cane growth and blossom production. Torrents in September encouraged fungus, which considerably diminished yield, so for the past couple of years, the early crop has been the more productive. Whatever, it works. In addition to using them fresh, I make raspberry shrub, jam, raspberry cordial, raspberry vinegar, and freeze fresh berries like mad for winter pies and cakes and trifles. 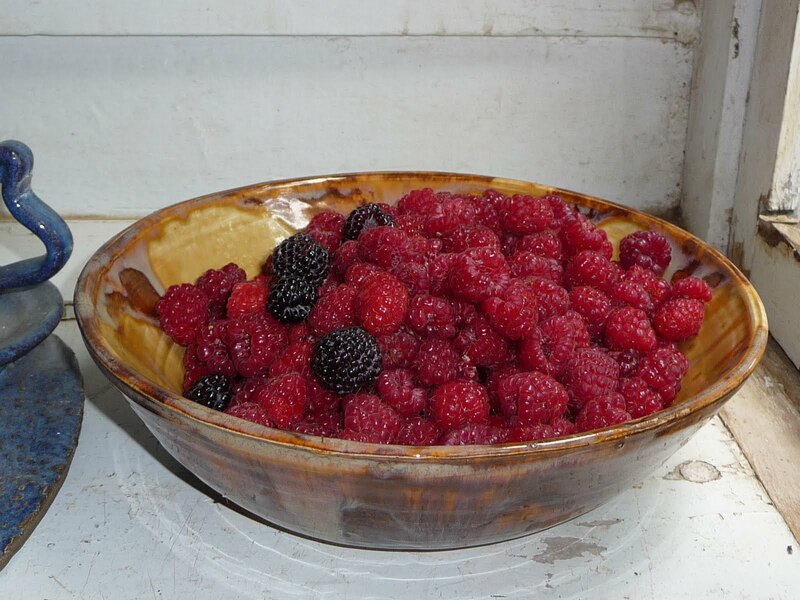 But by the time November rolls around, I’ve about had it with raspberries. The patch is overgrown and I have no ambition left to deal with it. Until now. Monday in the late afternoon, I went out with the nippers in hand and cart in tow. Thick with timothy, the blowsy seed heads of spent wild aster, blackened mare’s tail, and the pathetic remains of the moonflower vine that grows up one northwest support, and a percentage of finished two-year-old canes, it looked doable in the allotted time frame between gorgeously slanting sun and twilight. 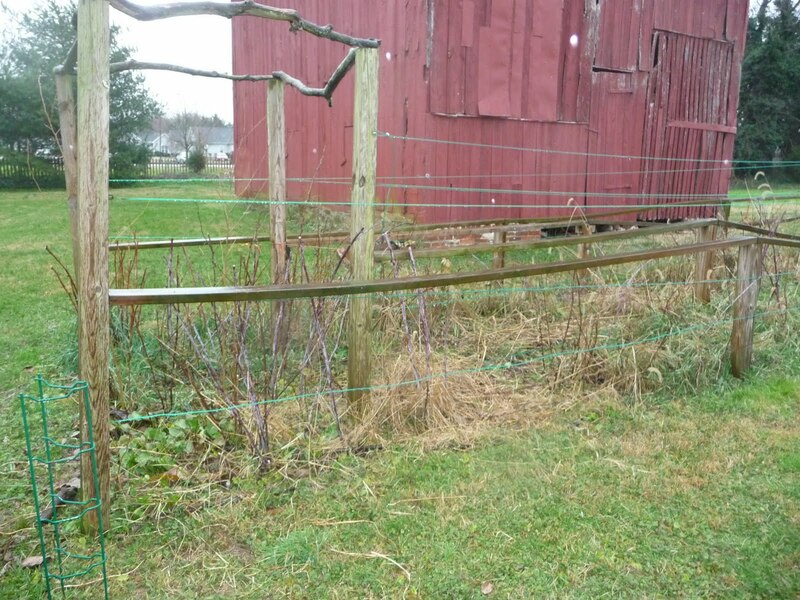 I yanked out the most egregious offenders including lots of rooted, lethal-thorned black raspberry whips and clipped the remaining canes to hip height. I left the invasive white mulberry saplings, which will need digging, for another day. The pace was delightfully contemplative. Twilight descended, and I trundled back in, delighted with having gardened. today was certainly a great day to piddle around in the garden! Great post!